What do Rachael Ray and Marc Vetri have in common? Not much. But I stole from both of them to get these glorious roasted potatoes. Ray’s mayo-free roasted potato salad includes a generous handful of fresh basil and has become a picnic go-to for me. And Marc’s instructions for Roasted Herbed Fingerling Potatoes (out of his first book, Il Viaggio di Vetri), include a benedictory splash of fresh lemon juice. Heavenly aroma, and the acid acts almost like that spark of malt vinegar on a cone of chips. Bonus: another opportunity to put a lash or two of garlic scapes to work while they’re still around. Toss. Put a few big spoonfuls of the garlic slurry in a bowl. Add the potato pieces and toss to coat. Save the rest of the slurry for other uses over the next week. * Or freeze it for longer storage. Roast. 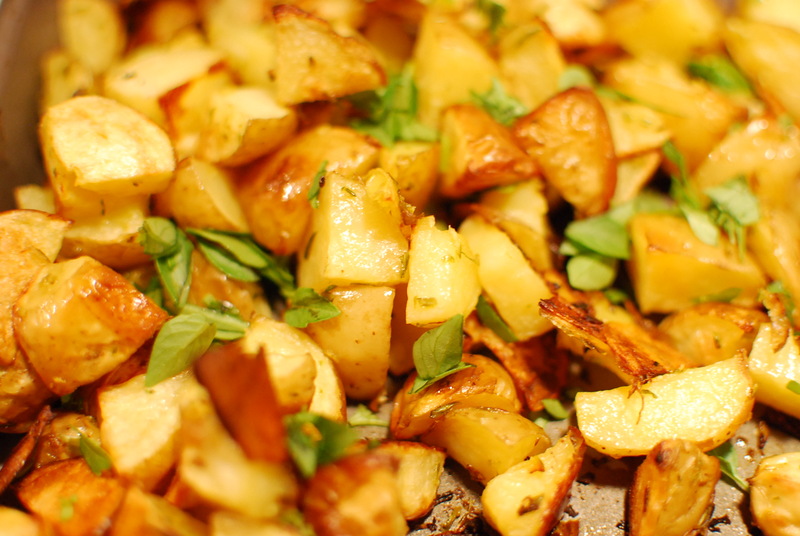 Spread the potatoes onto a roasting pan and cook for about 15 minutes, until well browned. Shake the pan a few times during cooking if you don’t want crispy bits stuck to the pan. Don’t, if you do. Dress. Return the hot potatoes to the original bowl. Squeeze in the lemon juice, and add basil (you could use any aromatic herb, really – try chives, flat parsley, thyme, sage, rosemary, savory). If you want, grate in a little lemon zest for added zing. Toss quickly, and serve. It’s great piping hot, while you can still get a lemon-scented facial from the steam, but it’s just as good at room temperature. The same base makes a brilliant wet rub for grilled meats. 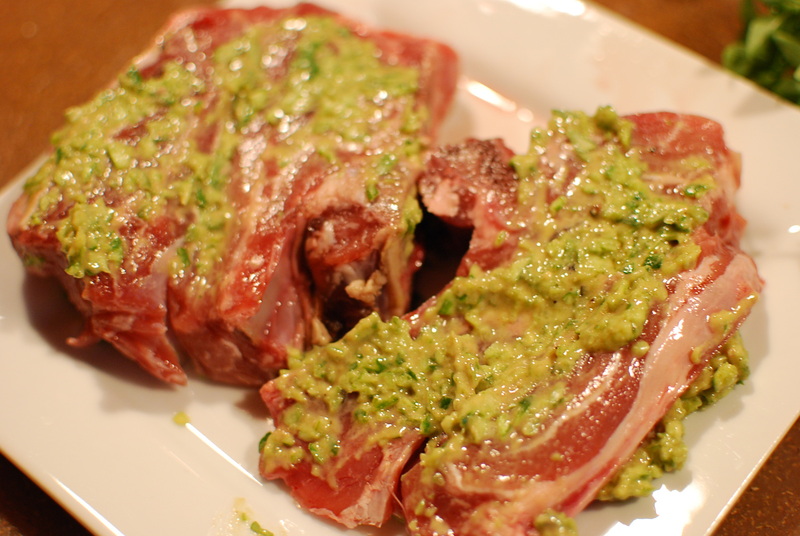 *That same night, I added a little Dijon mustard and rosemary to smear on some lamb chops (Livengood Family Farm via the Fairmount Farmers Market) before they hit the grill. A few days later, I whirred in a handful of almonds and grated parm for a terrific, quick pesto over linguine.